This beachfront paradise, set on the white sandy shores of O'ahu in Ko Olina, was created with families in mind, by the people who know families best. Perfectly placed on a beautiful beachfront cove, Aulani offers kids, adults and families Hawaiian vacation experiences with a special magic that only Disney can create. Aulani, Disney Vacation Club accommodations include hotel rooms, studios and villas with options of garden and ocean views. 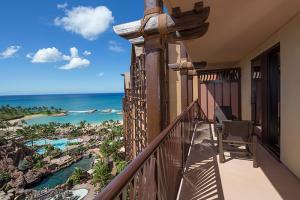 Located in beautiful Ko Olina, on the Leeward Coast of Oahu. Sheltered by mountains to the north, Ko Olina is a secluded paradise in a beautiful island setting, yet close enough to Waikiki to enjoy the shopping and activity there. ʻAMAʻAMA – Contemporary Island Cooking; Makahiki - Disney Character breakfast and casual dinner buffet; Ulu Cafe. U.S.S Arizona Memorial & Pearl Harbor, Historical Iolani Palace, Waikiki Aquarium, Polynesian Cultural Center.